The cockpit is really nice. 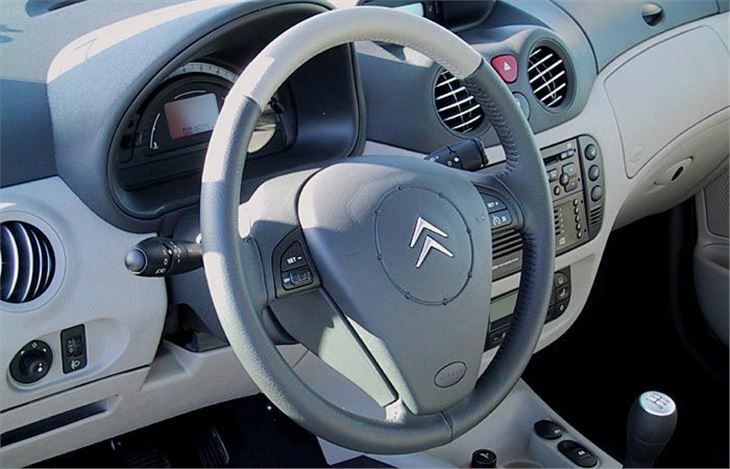 Seats and steering wheel both adjust for height and reach, so everyone from four foot six to six foot four should be able to find a decent driving position. The dash itself is digital, with a central large speed display and a sort of wraparound rev counter, with engine temperature and fuel contents measured by stacked LEDs rather than fiddly needles and gauges. The electric door mirrors fold electrically, which is very handy for anyone with a narrow garage and for parking on narrow streets. Acoustic parking is provided by optional reverse distance bleepers rather than the crunch of plastic bumpers. If cruise control is fitted it's controlled from the steering wheel, with a button to set a speed alarm. There are plenty of storage places and cubbies, including a pair of drawers under the front seats. Cupholders abound and, as part of a special option pack for keeping children happy there are small folding trays on the backs of the front seats. Citröen has been particularly clever about the 305 litre boot, which is very deep and carries a full-size spare wheel in a well inside rather than on a wire frame slung underneath. 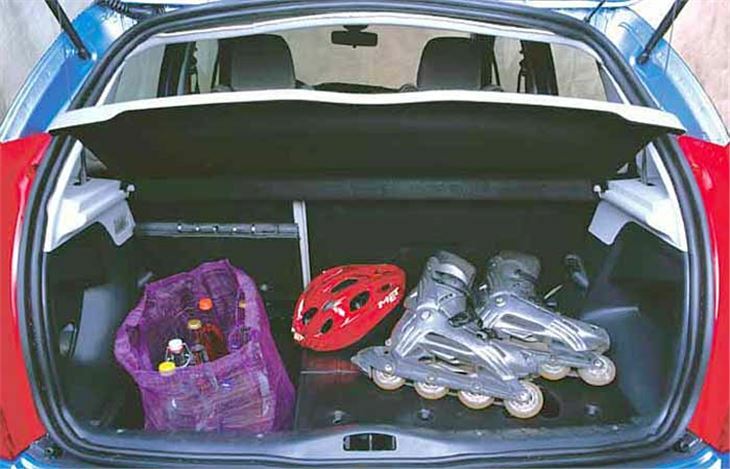 To make life easier for all of us, the boot has a split-folding false floor, which raises load height to sill height and gives a flat floor when the back seats are folded. 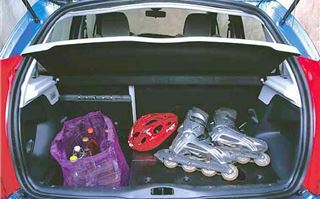 Bottles, bags and all the things that fall over and spill in a conventional boot can be kept upright and safe by this 'Moduboard'. Though everyone sits upright, the big disappointment about the interior is a surprising lack of legroom and headroom in the back. Kids will have no problem, but a six footer cannot comfortably sit behind himself and may well find his hair rubbing on the ceiling. 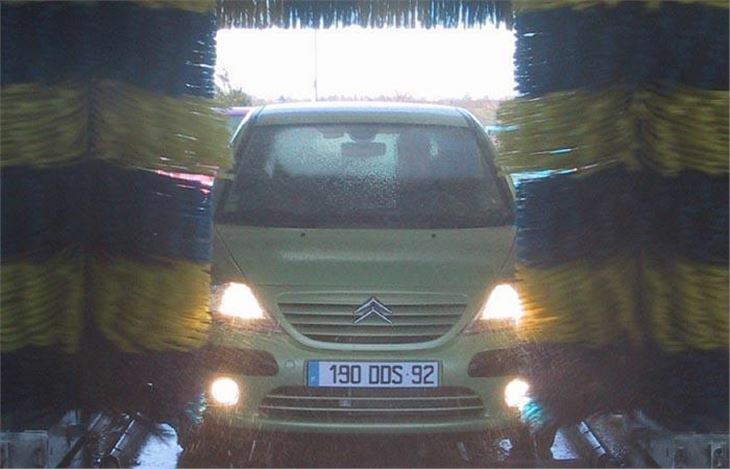 Safety is well covered by standard ABS with EBD, automatic hazard lights under emergency braking, a big dashboard button to lock and unlock the rear doors, and, of course, five lap and diagonal seatbelts, plus front and front curtain airbags. What's it like to drive? Well, I have to tell you that the 70bhp 1.4 HDI diesel is a revelation. It's sweet, quiet, revs almost like a petrol engine, yet delivers a lot more torque. Exactly what most drivers want, with the bonus of a near incredible combined mpg figure of 67.3 mpg. It really feels as if the car and this engine were made for each other. Steering through the electric motor powered rack is nice and precise. Ride quality is pleasantly absorbent. Handling is brings a smile to your face and I have no complaints about the roadholding. It's a great little car. With less than 1,000kg to tug along, the 5bhp power disadvantage compared to the VW Polo 1.4 TDI feels like a 5bhp advantage. Unfortunately both other versions of the C3 I tried did not match up to the diesel. 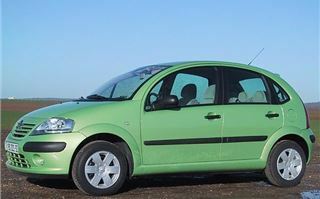 The 1.4 automatic has 75bhp and a four-speed box offering self-selection. Only, like a German Tiptroninc, the selector works counter intuitively (the wrong way round). Instead of nudging it forward to change down and back to change up you're obliged to do the opposite of what comes naturally. And, left to its own devices, the box frantically changes up and down when you least expect or want it to. So it's an automatic, but not an automatic I would automatically choose. Then there was the 110bhp 1.6 16v, on paper a junior GTi. Except it didn’t feel like one. The engine isn't willing or sporty and rocks so violently on its soft mountings that gearchanges which should have snicked through can grind and crunch. The stiffened suspension also makes the car feel bumpy and less secure, a bit like the old VW Polo GTi. I wasn't enjoying myself at all until I handed over to The Telegraph's Andy English who's a much better driver than me. He managed to work the car, got it to handle through bends and show its stuff without doing anything unpleasant or unpredictable. He proved it could be driven quickly and safely. Yet we still agreed with each other: the 1.4 diesel is the pick of the bunch and the C3's most natural incarnation. At the end of the presentation we were shown a French launch commercial for the C3. A guy and a girl are driving along in one with the huge optional glass sunroof. The along comes a low flying Mirage fighter aircraft (or whatever). The pilot does a flip, so his transparent cockpit is directly above the girl passenger. She smiles up at him. He smiles down at her. Her boyfriend smiles at the bridge they are rapidly approaching. At the last second, the pilot spots the bridge, turns his plane round and climbs. Cue the strapline, "La vie est Belle" (life is beautiful). 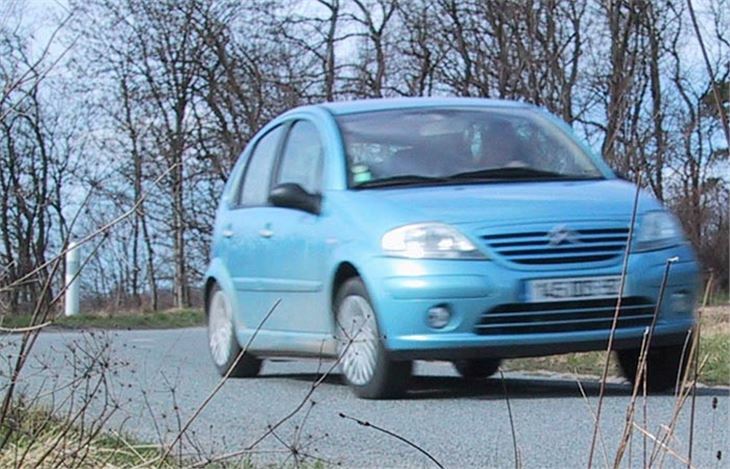 In France, C3s start at 11,050 Euros (£6,906 - £7,367) for the 1.1X and 11,850 Euros (£7,406 - £7,900) for the 1.4SX. 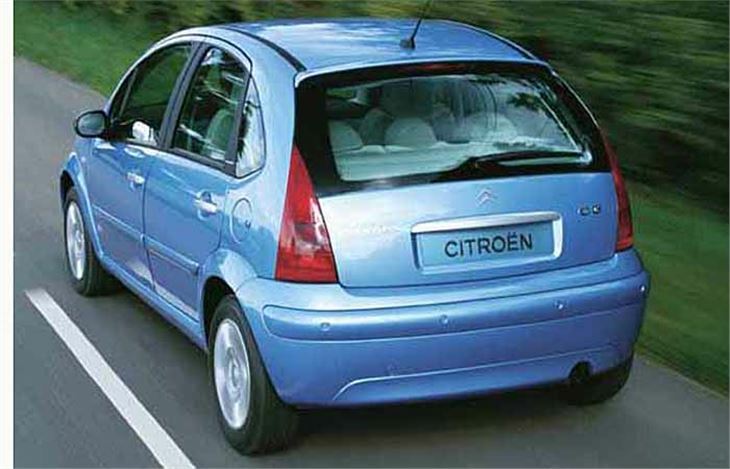 But Citröens in the UK have a three year warranty, which is rather better than in France, and the company was talking about UK starter prices of around £9,000 for the 1.4SX, to match the £8,995 of the Honda Jazz. But, much more significantly, in France the base X version of the 1.4 diesel comes in at 12,900 Euros (£8,063 - £8,600). 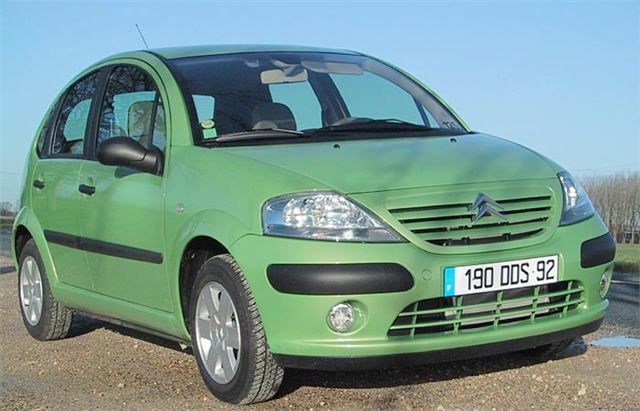 If Citröen can offer this sprightly 67mpg car at less than £9,000 in the UK it really will have a winner on its hands.